Spork-Fed is a savvy, upbeat introduction to vegan cuisine written by sisters who know great food Flavor is the top priority in these easy-to-prepare recipes, many of them gluten-free. With full-color photographs throughout, this visually striking book shows you how to make everything from decadent desserts to homemade tofu. The Spork Sisters share more than 75 delicious recipes, along with dozens of health tips. In addition to the recipes, Spork-Fed's themed menu pairings will help any cook prepare for special occasions, quick family weeknight meals, or extravagant feasts sure to impress any guest. 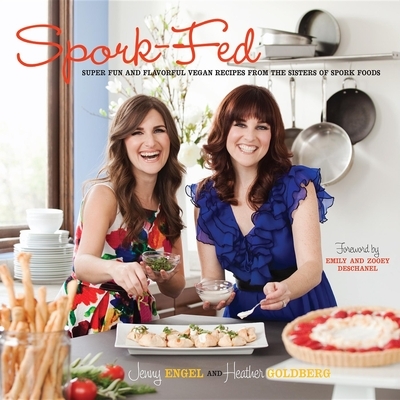 Jenny Engel and Heather Goldberg are the sisters behind Spork Foods. They own and operate an organic vegan cooking school in Los Angeles (opened in 2006). Recently, they launched a membership-based website, sporkonline.com, where they teach to a world market and have subscribers from India to Bermuda, all over Europe and beyond. Their work has been featured in the L.A. Times, the Huffington Post; they are regular expert contributors to VegNews Magazine and won a 2010 Veg News "Veggie Award" for excellence. The entrepreneurial sisters have also been featured on The Style Network as cooking instructors to the stars.